2019-01-10T20:31:06.254Z| vmx| I125: [msg.cpuid.vhv.enablemismatch] Configuration mismatch: The virtual machine cannot be restored because the snapshot was taken with VHV enabled. To restore, set vhv.enable to true. After that configuration was added to the config file, vMotions began to function as expected. Continuing on from my previous post; Backup, Restore And Replicate App Volumes, AppStacks And Writable Volumes another large challenge I faced running a Global Enterprise VDI environment was managing the Golden Images. For those of you who might not be familiar with VDI environments, Golden Images are the virtual machines that virtual desktop pools are created from. If you need to add an application or make an OS customization for all of your end users, typically you will make the change in the Golden Image and then push that image out to the virtual desktops. When a VDI environment consists of multiple sites, each separate site usually has its own instance of VMware Horizon or Citrix XenDesktop/XenApp. Each of these separate VDI instances will need their own Golden Images from which virtual desktop pools will be created. In an ideal world, being able to use the same Golden Images for all desktop pools regardless of which site they are in would make the most sense as typically the Pools are the same between sites and this will keep desktop images consistent for all end users. However, until now, this has proven difficult to achieve. There are, however, downsides to both of these methods. In both cases, the whole Golden Image is being replicated each time an update is made. If an image is 60GB in size and there are three remote sites, that’s quite a lot of data that needs to be transferred, this usually is a very slow transfer process and can put a heavy strain on the WAN infrastructure. Additionally, when these images are copied between sites, the vSphere Snapshots are lost in the process making it very difficult to roll changes back if there are issues as all snapshot history is lost. Because of these replication challenges, what we end up seeing is Golden Image sprawl, configuration drift, and an inconsistent-user user experience. Each site has its own set of Golden Images, which are similar to the other sites, but over time the configuration of these images deviates from the other sites. These additional Golden Images also add operational overhead. Each image will need to be patched and kept up to date. The more images you have, the harder it is to keep track of them and the longer updates take to roll out. It shouldn’t be this painful. It doesn’t need to be this painful! Using Datrium DVX it only takes a few clicks to replicate Golden Images between multiple sites. The following video (5 minutes) is a brief demonstration of how simple it is to replicate a new snapshot on a Golden Image to a second site. Deduplication and Compression – DVX uses the always-on global deduplication and compression service to only send the changes made to the Golden Image. 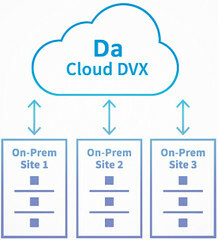 Rather than sending the whole virtual machine, DVX will only send the data that has changed. 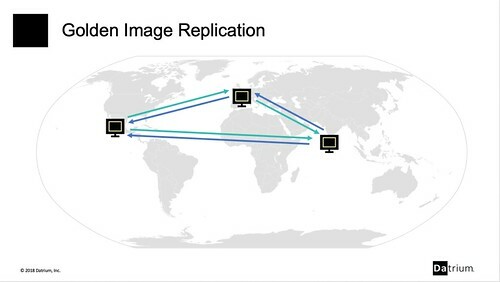 This dramatically improves replication times and reduces the load on the WAN infrastructure. Persistent vSphere Snapshots – When Golden Images are replicated between sites, so are vSphere snapshots. So each Golden Image will show the same snapshot history, regardless of the site they are in. This makes it a lot easier to rollback and forward changes. One of the biggest challenges I faced running VMware’s internal Horizon environment, was being able to backup, restore and replicate Writeable Volumes and AppStacks. Not being able to backup and replicate Writeable Volumes meant were unable to use Writables to capture our user’s data as we were unable to copy the data to an offline backup array for archive or replicate the data to our other data centers to be used in the event of a site failure. This is no longer a challenge using Datrium DVX. AppStacks – Packaged applications that get connected/disconnect to a user’s virtual desktop during login/logoff. Writable Volumes – Virtual disks that get connected/disconnect to a user’s virtual desktop during login/logoff. These virtual disks capture any changes made to the virtual desktop, giving a persistent user experience in a non-persistent VDI environment. Both AppStacks and Writable Volumes live their lives as VMDK files. This makes it very easy to connect/disconnect them to virtual machines during the login/logoff process. However, there is a massive downside to using VMDK files. AppStacks and Writeable Volume VMDK’s are not permanently associated with a virtual machine, which makes it is almost impossible to back them up using traditional vSphere backup software. Due to limitations in the vSphere API, traditional backup solutions can only back up virtual machines and virtual disks connected to the virtual machines. If a VMDK is not connected to a virtual desktop, it cannot be backed up at scale…. Until now. Running your Horizon environment on a DVX platform makes backing up and restoring App Volumes AppStacks and Writable Volumes almost a single click process. Don’t believe me? Check out this video I recently captured showing the backup and restore of a Writable Volume. Replicating Writables and AppStacks is also just as easy as backing up and restoring them with Datrium DVX. I’ve also created another video below to show you how simple this process is. Over the past 10 years, I’ve been a part of this amazing community. Without this communities support, I wouldn’t have landed my dream job as a consultant within VMware, nor become a Double VCDX. At VMworld 2018 this year, I was lucky enough to spend 20 mins talking to the vCommunity about how they can harness the vCommunity to help further their career. This session was recorded and made available online. In this session, I will share my story and highlight ways that you too can leverage our community to help you reach your career goals and aspirations. I hope you find this useful. Feel free to message me on Twitter if you have any questions on the content or want to discuss things further. In an attempt to try and clean up my Twitter feed to make Twitter conversations and tweets a little easier to notice and follow, I followed the recommendation given to me by my followers and decided to split the Twitter accounts I follow into Lists, so they are easier to sort and categorize. One of the lists I started to put together was a vCommunity Twitter List. This list contains many of the people who make up the vCommunity. One of the cool things about Twitter Lists, is you can see people who have been added to the lists and you can Follow them on your own account. It’s a great way to find people with the same interests. As you can imagine, the vCommunity Twitter List is designed to include people who mostly tweet about Virtualization topics. Although this is a very informal list, as I mentioned earlier, the whole aim of this list is to remove unnecessary noise from my Twitter feed. So I need to try and put some restrictions in place. I understand that from time to time we all tweet about a wide variety of topics, try and limit the following, if possible. Endless Retweets – We want your thoughts, not just the thoughts of others. 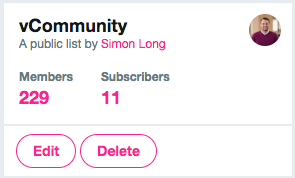 The vCommunity Twitter List is still a work in progress and always will be. My intention is to keep this Twitter List dynamic. As new people join Twitter and start to tweet about relevant Virtualization topics, they’ll be added. And on the flip side, as people’s interests change and maybe their tweets are no longer focused on the topic of Virtualization, they will be removed. If you want to be added to the List, please message Follow Me and message me on Twitter. What is Datrium Cloud DVX? In a previous post, I talked about ‘What is Datrium DVX?’. If you are not familiar with Datrium DVX, I’d recommend reading that post first as Cloud DVX integrates with on-premises DVX. Cloud DVX is a SaaS-based service offered by Datrium that enables on-premises DVX customers to replicate backup snapshots of their virtual machines and files into public cloud storage (AWS). Hey guys, I have some exciting news for you. Today, we (Datrium), announced CloudShift. Below I’ve summarized some of the things that really excite me about CloudShift. However, before I begin, I think it would be a good idea to quickly go over how Datrium DVX handles Backups and Replication for those of you who might be new to this solution. As mentioned in my previous post; What is Datrium DVX?, DVX is a Primary storage solution that provides extremely fast storage performance to virtual machines and applications running on DVX Compute Nodes. This is achieved by caching all required data locally on SSD devices installed on the Compute Nodes. DVX then adds a layer of protection by replicating all write IO’s over to the DVX Data Node which acts as a mirror copy for all of the data living in the SSDs on the Compute Nodes. 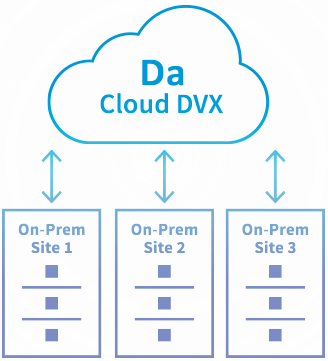 The Datrium On-Prem DVX system provides a built-in backup mechanism for protecting and restoring data. Protection Groups can be used to group a set of workloads together. Protection schedules are then be applied to the Protection Group based on how regularly data snapshots should be taken and how long they should be kept for. These Snapshots can then be replicated either to another On-Prem DVX system or to a Cloud DVX instance running in AWS. Hopefully, that gives you enough background for the next section. On-Prem (primary) failover to On-Prem (secondary) using backups that are stored at the On-Prem (secondary) site. I feel this covers the majority of failover scenarios that our customers need to restore their business in the event of a disaster. I imagine your next question is, “If this a SaaS-based solution, how do I get my data from one data center to another, or to the Cloud? Well, this is where Datrium DVX and Cloud DVX come into play. Scenario 1 is most commonly used when a customer has two data centers, both of which have a Datrium DVX. The DVX is configured to continually replicate data using Elastic Replication from the primary over to the secondary data center (and possibly vice versa). In the event of a failure in one of the datacenters, CloudShift will orchestrate the failover of workloads from one data center to the other. Thanks to the replication technology in DVX, Recovery Point Objective (RPO) times can be less than 1 minute. VMware just released Security Advisory VMSA-2018-0019 for customers who are using VMware Horizon v6 or v7 and the Horizon Client for Windows. As many of my readers are VMware Horizon customers, I thought I’d bring this to your attention in case you missed the official notifications from VMware. Out-of-bounds read vulnerability in the Message Framework library. Horizon 6, 7, and Horizon Client for Windows contains an out-of-bounds read vulnerability in the Message Framework library. Successfully exploiting this issue may allow a less-privileged user to leak information from a privileged process running on a system where Horizon Connection Server, Horizon Agent or Horizon Client are installed. Note: This issue doesn’t apply to Horizon 6, 7 Agents installed on Linux systems or Horizon Clients installed on non-Windows systems. For further information and direct links to the patch downloads, visit the Security Advisory VMSA-2018-0019 page. 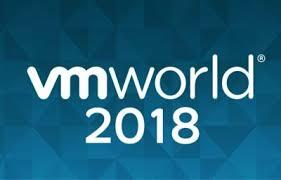 Hey, another VMworld is almost upon us. I am fortunate enough to be talking again this year. However, this will be my first VMworld where I won’t be speaking as VMware employee. Below you’ll find the information about my session. Be sure to register if you are interested in attending. Tuesday, Aug 28, 2:30 p.m. – 3:00 p.m. Session Summary: Over the past 10 years, I’ve been a part of this amazing community. Without this communities support, I wouldn’t have landed my dream job as a consultant within VMware, nor become a Double VCDX. In this session, I will share my story and highlight ways that you too can leverage our community to help you reach your career goals and aspirations. Having recently joined Datrium, one of my first tasks is to begin to understand the product Datrium calls DVX. As a way of helping me wrap my head around this technology, I’ve decided to blog about it. I plan on starting at a high-level and then slowly digging deeper under the covers as I learn more. If you are interested in following my posts, you can subscribe here and follow me on Twitter. So to begin with, let’s start at the 100 level.